If "Leben" product is: (1)Directly imported by you from another country, (2)Purchased directly from a dealer OVERSEAS, (3)Acquired by you from an UNAUTHORIZED DEALER, (4)Considered gray market product and no Warranty Card accompanied, All Product Warranties by Leben are NULL and VOID. In addition, Leben will not supply parts and/or service for any "Leben" product without proof of purchase from a Leben Authorized Dealer. A new power amp CS-1000P was released featuring KT120 power tube. CS300 & RS30EQ were nicely reviewed by Mr. Art Dudley in Stereophile November 2011 issue. RS-30EQ wan "Writers' Choice Award 2010" on a famous US hi-fi magazine "Positive Feedback"
Polish authentic hi-fi magazine "High Fidelity" selected Leben CS-300X and CS-660P as the Best Products 2010 in Integrated amp and Power amp category. CS-300X(S) wan the GOLD Medal of French authentic hi-fi magazine "Diapason"
CS-600 was awarded by USA authentic hi-fi magazine "Stereophile" at the highest rating of "A"
in the integrated amplifier section. CS-200P power amplifier won The image hifi award 2010(Germany) in the category Power Amplifiers. GE JAN5751 tube used for CS-300 and CS-300X(S) was replaced by Sovtek 12AX7A due to unavailability of GE 5751. A new preamplifiers RS-100 and RS-100U were released for overseas market. 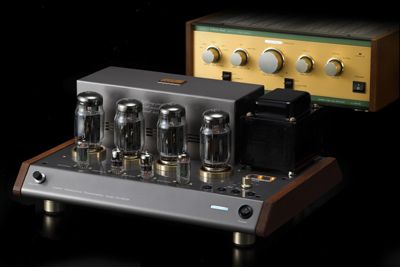 RS-28CX(Preamplifier) and CS-660P(Power Amplifier) were selected by 6-moons/USA as the best amp of 2008 in each category. We are going to replace GE 12AT7 used in RS-28CX and RS-30EQ gradually by newly found 12AT7 made by "RFT"(Germany) which creates better performance than GE's. RS-28CX(Preamplifier) was selected by a Polish authentic hi-fi magazine " HighFidelity" as the "Best product 2008" in Amplifier category. A power amplifier CS-250 has been exhausted and no more productions are available. Released a new Phono Preamplifier RS-30EQ equipped with CR-Type Non-NFB phono equalizer. CS-660P Power Amplifier was highly evaluated by Mr. Jeff Day on 6-moons/USA. RS-28CX preamplifier(with CS-660P) was again reviewed very nicely by Mr. Jeff Day of 6-moons/USA. CS-660P won "Diapason d'Or GOLD MEDAL" in Amplifier category 2007 by an authentic French magazine "Diapason"
The price of CS-600 and RS-28CX was revised according to rise of the cost of materials. The price of CS-300 was revised according to rise of the cost of materials.